I've been privileged to meet a number of commited young people from the US, who have relocated to El Salvador to serve in various ways. Some of them also write compellingly about their experiences. In an unprecedented proceeding, CJA's International Attorney, Almudena Bernabeu, took evidence yesterday from the only surviving non-military eye-witnesses to the massacre which occurred just over twenty years ago at the University of Central America "José Siméon Cañas" (UCA). Jorge and Lucía Cerna testified before Spanish Judge Eloy Velasco from the United States via video conference. This proceeding marks the first time that the U.S. government, to our knowledge, has allowed evidence to be taken on U.S. soil in a human rights prosecution in another country. A representative from the U.S. Department of Justice was present for the Cernas' testimony. 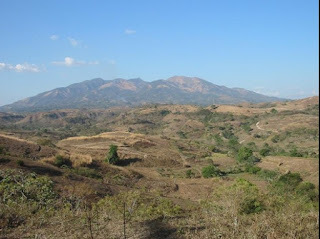 The beginning of 2010 has been a time of fact-finding missions to the Cabañas region of El Salvador, as international groups, deeply concerned by the violence in Cabañas that appears related to gold-mining, have come to the region to gather facts and make their own evaluations. Join us for a ride on the local commuter train, but first a bit of history. The current railroad company is the result of a merger between two companies, one of which is the International Railways of Central American, a former subsidiary of the infamous United Fruit Company (of Banana Republic fame). Thousands fled El Salvador during the civil war, hopping on freight trains headed out of the country. After the war, passenger traffic declined as the trains were routinely held up and passengers robbed. In October 2002, all rail transportation was suspended. With El Salvador the most highly populated country in Central America and with a severe shortage of land, the former right-of-ways were settled by squatters. Northeast of San Salvador lies the ancient Guazapa volcano. Over the past 10 years, many of my visits have involved spending time in communities around the volcano. During El Salvador's civil war, this was a battle zone. Three documentaries pull together a view of Guazapa then and now. Dr. Charles Clements had been a US Air Force pilot in Vietnam before he left the military, and became a Quaker and a doctor. Clements then spent a year behind FMLN lines in Guazapa treating civilians needing medical care in the war zone. The Academy Award winning short documentary, Witness to War, is based on his memoir of the same name. A new ITUC study on core labour standards in El Salvador reports that many of the 67,000 mostly women workers employed in the country’s 15 export processing zones suffer from appalling treatment ranging from verbal abuse and threats to physical abuse and sexual harassment. There is a clear anti-trade union policy and dismissal of workers planning to join or form a union. Many consider that working conditions in export processing zones can be assimilated to forced labour. The complete report in Spanish is available here. Nine months into his presidency, Mauricio Funes continues to follow his moderate left-wing policies. He is a far departure from the decades of right-wing presidents before him, but he has also acted independently of the hard-line leadership of the FMLN. I don't like writing about the crime problem in El Salvador or the ongoing wave of homicides striking all parts of the country. There's too much grief, pain and hopelessness in confronting the problem. And it is clear that the current government, like governments before it, has no idea how to turn the tide. But it's too important a topic not to cover. [In the first 36 days of 2010], around 440 murders have been reported in El Salvador. The victims range from political activists, presumably killed for their opinions and public pronouncements, to bus drivers, robbed and murdered by groups locally called delincuentes. Recently in Suchitoto, 7 people were killed in a single incident, now being pronounced a massacre by community members. If this pattern of violence continues consistently, the country could expect to experience near 5,000 homicides this year. Baptised Janet Ruiz, Martina was just 18 months old when [her mother] Graciela last saw her. It was 1982 and El Salvador was engulfed in a brutal civil war. A year earlier, the family had been driven out of their village in the east of the country by left-wing guerrillas who had also killed Martina's father. Left alone to bring up four young children, her mother did not know where to turn for help. El Salvador receives 3 times as much water in rainfall as what its 6 million inhabitants consume annually, yet 40% of Salvadorans do not enjoy potable water in their homes. This year marks the 30th anniversary of the assassination of archbishop Oscar Romero. Romero was assassinated while saying mass on March 24, 1980 in a killing ordered by right wing death squad leaders. With the 30th anniversary date approaching, we are going to see more articles about Romero, his legacy, and his formal recognition as a saint of the Roman Catholic church. (Multitudes of the common people Romero loved in El Salvador already view him as a saint).